Yes, I admit this is the Kettle River valley. When I find my pics of the Similkameen River valley I will add them in here. Sorry! Yes, new computers can be really annoying! In 1849, Royal Engineer Lieutenant Henry Spencer Palmer rode over the brigade trail to Fort Colvile at the side of Angus McDonald, who was then in charge of that Columbia River post. I will be working on this part of my manuscript tomorrow, and so it is not a bad idea to get a jump start and figure out where the brigades actually are as they travel through this valley. I have Palmer’s map as well as some good backroad maps, so that might make this process a little easier. So, let’s start at the junction of the two rivers — the Tulameen, and the Similkameen. The date is September 22. The junction of [the] two rivers is named the “Vermillion Forks,” from the existence in its neighbourhood of a red clay or ochre, from which the Indians manufacture the vermillion face paint; but though I endeavoured to find its whereabouts, being anxious to procure a specimen, my search was unsuccessful. We camped this evening on the left bank of the Similkameen one mile below the forks, and shortly after our arrival were visited by some of the natives of the District. As our horses wanted a day’s rest after their weary mountain journey, I decided to remain two nights at Camp 6, and the weather being fine and clear, I was again enabled to take astronomical observations. From these I obtained a mean latitude of 49 degrees, 27′ 42″ N., showing a considerable error in all existing maps; but I feel confident of the accuracy of the observations, and that any future survey will verify the result obtained. September 24 and 25. The weather continued fine and clear, and we resumed our journey at an early hour. Passing over one of the mountain spurs, 300 feet high, at the narrow entrance to the valley [Darcy Mountain], the trail descends into a fine prairie, scantily timbered and containing excellent bunch grass. As the valley for the first 37 miles (comprising two days’ travel) exhibits the same general features, one description will suffice to afford the necessary information. Like most of the mountain streams, the Similkameen is extremely torturous, and the prairies, which alternate pretty regularly from side to side, vary in width from one-eighth to three-quarters of a mile, gradually increasing till towards Camp 8 they attain a breadth in places of a mile. The grass is generally of good quality, the prickly pear or ground cactus, the sore enemy to the unoccasioned traveler, being the surest indication of approach to an inferior description. Timber is for the most part scarce on the prairies, but coppices appear at the sharp bends of the river tolerably well wooded, and abounding in underbrush of willow and wild cheery, while near the base of the mountains it exists in quantities easily procurable, and more than sufficient for the requirements of any settlers who might at some future time populate the district. The soil is somewhat sandy and light, but free from stones, and generally pronounced excellent for grazing and farming; and though the drought in summer is great, and irrigation necessary, many large portions are always well watered by streams from the mountains, whose fall is so rapid as greatly to facilitate such further irrigation as might be required. In corroboration …. The river throughout its entire course in confined to a natural bed, the banks being steep enough to prevent inundations during the freshets (a favourable omen for agriculture), and its margin is generally fringed with a considerable growth of wood of different kinds. The mountains skirting either side of the valley are steep and frequently rocky, increasing in altitude towards Camp 8, where they attain a height of at least 2,000 feet, and their slopes are plentifully clothed with a forest of various descriptions of timber. The trail throughout is generally good, the mountain spurs at the bends and gorges of the valley, and down which slides frequently occur, being the only portions bad for travel, and many of these are avoided by fords, practicable in all seasons of the year. Two considerable streams fork with the Similkameen from the south south-west, both of which rise in the cascades, or rather in the mountainous region east of the main range and near the 49th parallel. The first, named the “Zloochman,” united with it about nine miles below “Vermillion,” and an old “Corrall,” near the mouth, admits of its position being easily recognized. A trail follows the river for some distance into the mountains, leading to no particular place, and Indian hunters, the original makers, are probably the only people who frequent it. The second, or “Na-is-new-low,” river forks about 17 miles further down. Up its valley runs a tolerably good trail leading to the mountains near the parallel, and as this route is both more practicable and shorter than that in the “Zloochman” valley, it has been used this autumn by the United States Boundary Commission for transporting eastward the whole of their stores, instruments, &c.
Several other mountain streams, some of them of considerable size, fork with the “Similkameen,” from the northward and eastwards, but their directions and the positions of their sources are possessed of little interest. Camp 7 appears to be on the north banks of the Similkameen where the river dips to the south, then goes east for a short distance, then turns south again. There are no creeks indicated, but high hills immediately behind the camp. The hills might be Stemwinder Mountain, and if so they would be in the region labeled Chuchuwayha 2, which is a Similkameen Indian Reserve today. Modern day Hedley, B.C., is more or less in the centre of this reserve (but not on reserve lands), and in Hedley is the Snaza’ist Discovery Centre. Further along the river is Palmer’s Camp 8. Remember that the camp numbers refer to those on the entire trail and not only those in the Similkameen Valley. The bend in the river, which Palmer called the Keeree-maous bend of the “Similkameen,” seemed to occur four miles after they had left their camp. This does not mean that this is where the modern-day town of Keremeos is, and in fact it is well down the valley. September 26th — A fine, mild morning. Travelling along from Camp 8, towards the Keeree-maous bend of the “Similkameen,” the valley gradually widens to upwards of a mile; the prairies become more extensive, and the soil richer; timber is chiefly confined to the uplands and banks of the river, and the mountains, though undiminished in height, are covered with grass, and assume a pretty park-like appearance. We camped tonight at a point near the southern extremity of this valley, where the trail leaves it, and an observation of Polaris, which gave me a latitude of 49 degrees, 03′ 20″ north, dispels all doubt as to the position of the boundary in reference to the valuable tract through which we had just travelled. Keremeos is here, but the big bend of the Similkameen occurs in Cawston, which is just east of Keremeos. At Camp 8, the brigades must have actually camped pretty close to where Keremeos stands today. Further along on their day’s hitching, the Similkameen River flowed south to cross the boundary line into American territory. 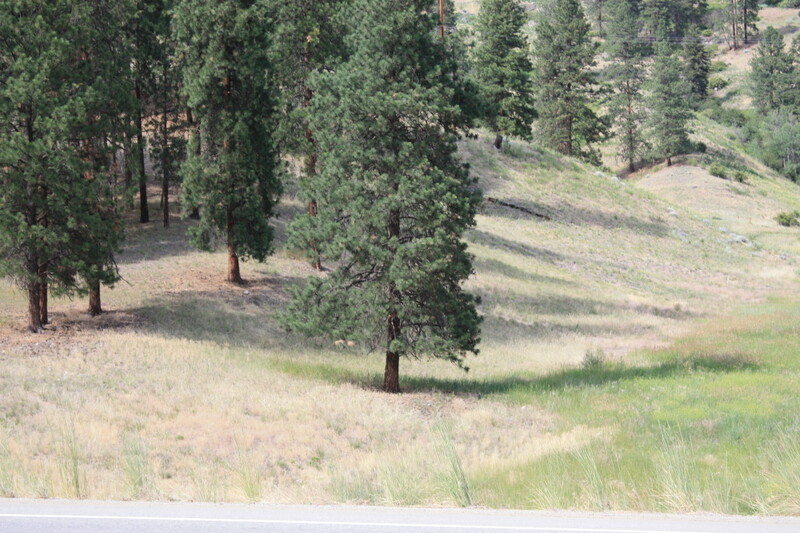 Fortunately for the HBC men, they had an easy route east to the Okanagan River and Osoyoos Lake, through a gentle pass. This is Richter Pass, named for Frank Richter who worked at the Similkameen Post, and who traveled over the pass many times in his career. The modern-day highway also follows this route. Thanks for posting this! I am currently doing extensive research on the old mining trails and fur trade activities in the Similkameen Valley starting at Osoyoos and trending west and then north into British Columbia. I would love to compare notes with you sometime. 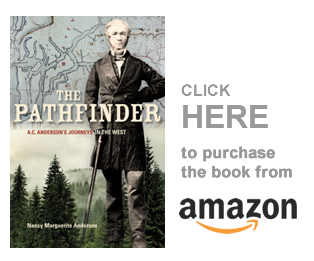 I have your Pathfinder book, but it does not contain the referenced (above) portions of the Anderson and Palmer maps in the areas I am currently investigating. You have my appreciation for the research you have conducted bringing these resources together and making them accessible to the larger historical community.